PBS (in NY, Channel 13) has been home to several Henson productions including the beloved Sesame Street and, most recently, Sid the Science Kid and Dinosaur Train. The original network, National Educational Television (NET), came into being in 1954, the same year that Jim started work on television. Jim’s first project for it was a group of programs produced with WITF, the public station in Hershey, PA, for their “Adventures in The Arts” series. This included The Muppets on Puppets, a behind the scenes/demonstration show taped in June 1968 (just before Jims’ first meetings on Sesame Street) and three additional segments taped the following year. The program won Jim an NET Award for Excellence. Sesame Street premiered on NET in November 1969, and by the time the Sesame Street Muppets appeared to help with the fundraising auction in 1975, the show was integral to the success of both the local station and the national network. In 1994, the producers of the Great Performances series (based at New York’s Thirteen) created an in-depth documentary about Jim and his work called The World of Jim Henson. It aired that November 23rd. Three years later, as part of Thirteen/WNET’s annual Gala on April 17, 1997, the entire Henson family was honored for their many contributions to the station over the years in the area of family programming. The others honored that night were Tom Brokaw (news and public affairs), Peter Martins (the arts), and Alex Trotman (science and nature). Learn more about Jim’s first public television project, The Muppets on Puppets. 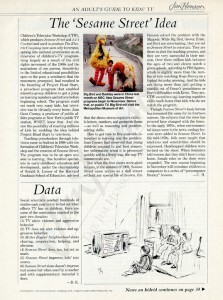 Thirteen’s Dial magazine often covered Sesame Street and its impact, as it did here in June 1983. 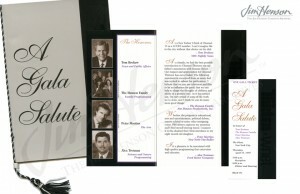 The program for the Thirteen/WNET gala, April 17, 1997. This entry was posted in 06-June '75, 1975, Appearances and tagged Alex Trotman, Dinosaur Train, Great Performances, Hershey, National Educational Television, NET Award for Excellence, PA, PBS, Peter Martins, Sesame Street, Sid the Science Kid, The Muppets on Puppets, The World of Jim Henson, Tom Brokaw, WITF. Bookmark the permalink.